The wine supply ran out during the festivities, so Jesus' mother told him, "They have no more wine." "Dear woman, that's not our problem," Jesus replied. "My time has not yet come." As the old saying goes, "Timing is everything!" Deliver the punch line of a joke without enough pause, or too much pause, and the joke falls flat. Rush your proposal for marriage, and you may not be taken seriously. Apply for a job at the wrong time, and you won't be hired. Jesus lived "on the clock." 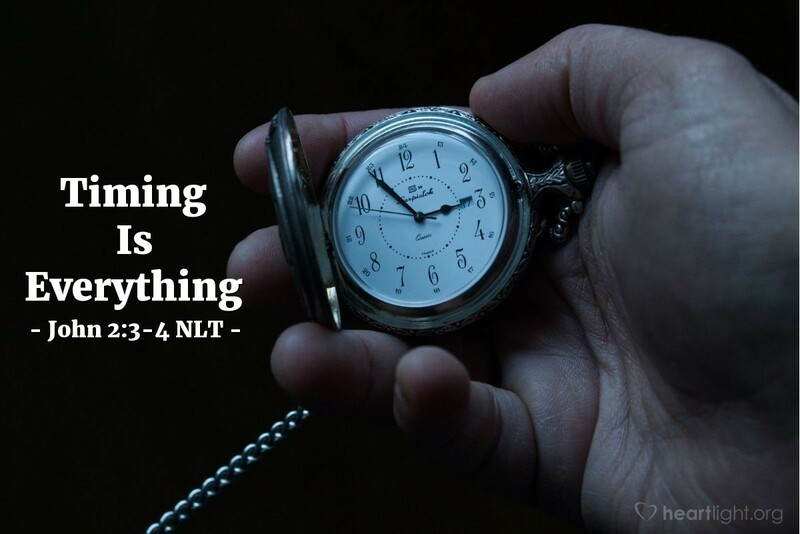 He lived by God's sense of timing, so he ordered his plans based on God's will and God's timing. He came to the world at just the right time. He went to the cross at just the right time. He was raised from the dead at the time he had promised. While we may not ever know what the timing will be for significant events in our world, we can base our lives on the will, work, and timing of God. To do otherwise would be to miss the redemptive moment in the lives of many people God wants us to influence. Father, I know I will never have the same sense of timing in my life that Jesus did for his, but please make me alert to your timing in my life as I commit to making my heart open to your will. In Jesus' name. Amen.